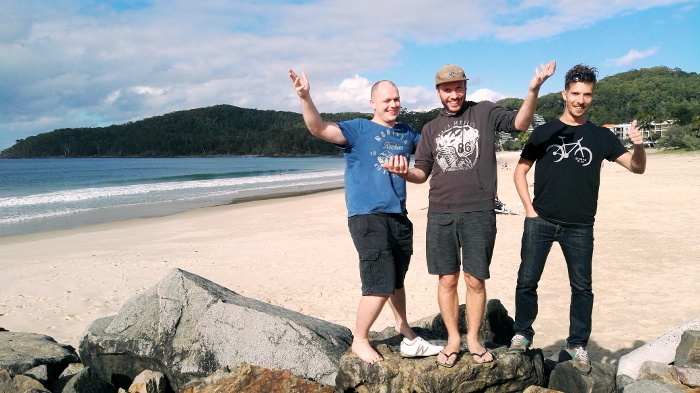 Last week we kicked off the first (of hopefully many) Australian QGIS hackfests Developers Meetings. It was attended by 3 of the core QGIS development team: Nathan Woodrow, Martin Dobias and myself (Nyall Dawson), along with various family members. While there’s been QGIS hackfests in Europe for over 10 years, and others scattered throughout various countries (I think there was a Japanese one recently… but Twitter’s translate tool leaves me with little confidence about this! ), there’s been no events like this in the Southern hemisphere yet. I’ve been to a couple in Europe and found them to be a great way to build involvement in the project, for both developers and non-developers alike. In truth the Australian hackfest plans began mostly an excuse for Nathan and I to catch up with Martin Dobias before he heads back out of this hemisphere and returns to Europe. That said, Nathan and I have long spoken about ways we can build up the QGIS community in Australia, so in many ways this was a trial run for future events. It was based it in Noosa, QLD (and yes, we did manage to tear ourselves away from our screens long enough to visit the beach!). ... do something with the vertex! Martin is also planning on extending this work to allow simple iteration over the parts and rings within geometries too. When this lands in QGIS we can expect to see much faster geometry operations. Nathan fixed a long standing hassle with running standalone PyQGIS scripts outside of the QGIS application on Windows. In earlier versions there’s a LOT of batch file mangling and environment variable juggling required before you can safely import the qgis libraries within Python. Thanks to Nathan’s work, in QGIS 3.0 this will be as simple as just making sure that the QGIS python libraries are included in your Python path, and then importing qgis.core/gui etc will work without any need to create environment variables for OSGEO/GDAL/PLUGINS/etc. Anyone who has fought with this in the past will definitely appreciate this change, and users of Python IDEs will also appreciate how simple it is now to make the PyQGIS libraries available in these environments. Nathan also worked on “profiles” support for QGIS 3.0. This work will add isolated user profiles within QGIS, similar to how Chrome handles this. Each profile has it’s own separate set of settings, plugins, etc. This work is designed to benefit both plugin developers and QGIS users within enterprise environments. You can read more about what Nathan has planned for this here. I continued the ongoing work of moving long running interface “blocking” operations to background tasks. In QGIS 3.0 many of these tasks churn away in the background, allowing you to continue work while the operation completes. It’s been implemented so far for vector and raster layer saving, map exports to images/PDF (not composers unfortunately), and obtaining feature counts within legends. During the hackfest I moved the layer import which occurs when you drag and drop a layer to a destination in the browser to a background task. On the same topic, I took some inspiration from a commit in Sourcepole’s QGIS fork and reworked how composer maps are cached. One of my biggest gripes with QGIS’ composer is how slow it is to work with when you’ve got a complex map included. This change pushes the map redrawing into a background thread, so that these redraws no longer “lock up” the UI. It makes a HUGE difference in how usable composer is. This improvement also allowed me to remove those confusing map item “modes” (Cache/Render/Rectangle) – now everything is redrawn silently in the background whenever required. Lastly, I spent a lot of time on a fun feature I’ve long wanted in QGIS – a unified search “locator” bar. This feature is heavily inspired by Qt Creator’s locator bar. It sits away down in the status bar, and entering any text here fires up a bunch of background search tasks. Inbuilt searches include searching the layers within the current project (am I the only one who loses layers in the tree in complex projects!? ), print layouts in the project, processing algorithms, and menu/toolbar actions. The intention here is that plugins will “take over” and add additional search functionality, such as OSM place names searching, data catalog searches, etc. I’m sure when QGIS 3.0 is released this will quickly become indispensable! Big thanks go out to Nathan’s wife, Stacey, who organized most of the event and without whom it probably would never have happened, and to Lutra Consulting who sponsored an awesome dinner for the attendees.